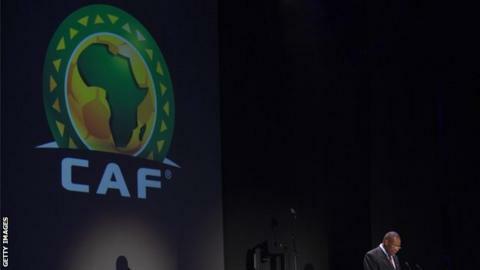 The Confederation of African Football (Caf) has said only four countries meet the criteria to be considered to host the 2017 Africa Cup of Nations. Of seven nations to orignally bid to replace Libya as hosts, Algeria, Ghana, Egypt and Gabon remain in the running. Caf decided Kenya, Zimbabwe and Sudan were not "compliant with the set criteria to be considered." Libya decided in August they would be unable to host the tournament because of security fears in the country. Caf has not yet set a date to take the vote to determine the new host country. At the same meeting of Caf's executive committee, concerns were expressed over the preparations for the both the African Under-17 and Under-20 Championships set for next year. "The report of the inspection mission noted delays in the undertaking of the planned works including notably the site at Mbour, scheduled to be the second venue of the competition," a statement from Caf read. "The Executive Committee instructed the chairman of the organizing committee of the CAN U20 to undertake another inspection tour in early December, before the final tournament draw." The Under-17 finals are set for Niger in February and also count as qualifiers for the Under-17 World Cup in Chile. "The president of the organising committee of the competition will travel to Niger in late November to assess the progress of works being undertaken at various stages as there has been a considerable delay," the Caf statement continued. "The draw for the competition was delayed and the executive committee has given Niger the last opportunity to catch up with the required works."